P. Huet and E. Sather, Electroweak baryogenesis and standard model CP-violation, Phys. Rev. D 51 (1995) 379 [hep-ph/9404302] [INSPIRE]. W. Bernreuther, CP violation and baryogenesis, Lect. Notes Phys. 591 (2002) 237 [hep-ph/0205279] [INSPIRE]. F. Buccella et al., Nonleptonic weak decays of charmed mesons, Phys. Rev. D 51 (1995) 3478 [hep-ph/9411286] [INSPIRE]. Y. Grossman, A.L. Kagan and Y. Nir, New physics and CP violation in singly Cabibbo suppressed D decays, Phys. Rev. D 75 (2007) 036008 [hep-ph/0609178] [INSPIRE]. CLEO collaboration, Amplitude analysis of D 0 → K + K − π + π −, Phys. Rev. D 85 (2012) 122002 [arXiv:1201.5716] [INSPIRE]. BaBar collaboration, Search for CP violation using T-odd correlations in D 0 → K + K − π + π − decays, Phys. Rev. D 81 (2010) 111103 [arXiv:1003.3397] [INSPIRE]. LHCb collaboration, Search for CP violation using T-odd correlations in D 0 → K + K − π + π − decays, JHEP 10 (2014) 005 [arXiv:1408.1299] [INSPIRE]. Belle collaboration, Search for CP violation with kinematic asymmetries in the D 0 → K + K − π + π − decay, Phys. Rev. D 99 (2019) 011104 [arXiv:1810.06457] [INSPIRE]. LHCb collaboration, Search for CP violation in the phase space of D 0 → π + π − π + π − decays, Phys. Lett. B 769 (2017) 345 [arXiv:1612.03207] [INSPIRE]. J. Rademacker and G. Wilkinson, Determining the unitarity triangle gamma with a four-body amplitude analysis of B ± → (K + K − π + π −)D K ± decays, Phys. Lett. B 647 (2007) 400 [hep-ph/0611272] [INSPIRE]. LHCb collaboration, LHCb detector performance, Int. J. Mod. Phys. A 30 (2015) 1530022 [arXiv:1412.6352] [INSPIRE]. T. Sjöstrand, S. Mrenna and P.Z. Skands, A brief introduction to PYTHIA 8.1, Comput. Phys. Commun. 178 (2008) 852 [arXiv:0710.3820] [INSPIRE]. T. Sjöstrand, S. Mrenna and P.Z. Skands, PYTHIA 6.4 physics and manual, JHEP 05 (2006) 026 [hep-ph/0603175] [INSPIRE]. P. Golonka and Z. Was, PHOTOS Monte Carlo: a precision tool for QED corrections in Z and W decays, Eur. Phys. J. C 45 (2006) 97 [hep-ph/0506026] [INSPIRE]. GEANT4 collaboration, GEANT4: a simulation toolkit, Nucl. Instrum. Meth. A 506 (2003) 250 [INSPIRE]. V.V. Gligorov and M. Williams, Efficient, reliable and fast high-level triggering using a bonsai boosted decision tree, 2013 JINST 8 P02013 [arXiv:1210.6861] [INSPIRE]. Fermilab E653 collaboration, Measurement of the relative branching fraction Γ(D 0 → Kμν)/Γ(D 0 → μX), Phys. Rev. Lett. 66 (1991) 1819 [INSPIRE]. N. Cabibbo and A. Maksymowicz, Angular correlations in K e4 decays and determination of low-energy π-π phase shifts, Phys. Rev. 137 (1965) B438 [Erratum ibid. 168 (1968) 1926] [INSPIRE]. B.S. Zou and D.V. Bugg, Covariant tensor formalism for partial wave analyses of ψ decay to mesons, Eur. Phys. J. A 16 (2003) 537 [hep-ph/0211457] [INSPIRE]. 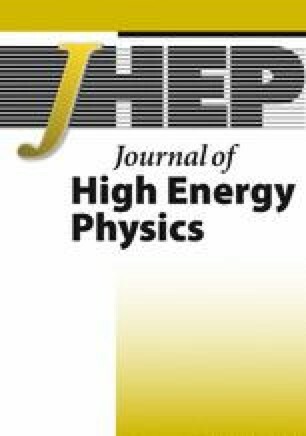 CLEO collaboration, Hadronic structure in the decay τ − → τ ν π − π 0 π 0 and the sign of the τ ν helicity, Phys. Rev. D 61 (2000) 012002 [hep-ex/9902022] [INSPIRE]. P. Lichard and M. Vojik, An alternative parametrization of the pion form-factor and the mass and width of ρ(770), hep-ph/0611163 [INSPIRE]. V.V. Anisovich and A.V. Sarantsev, K matrix analysis of the (IJ PC) = 00++)-wave in the mass region below 1900 MeV, Eur. Phys. J. A 16 (2003) 229 [hep-ph/0204328] [INSPIRE]. BaBar collaboration, Improved measurement of the CKM angle γ in B ∓ → D (*) K (*∓) decays with a Dalitz plot analysis of D decays to K S0 π + π − and K S0 K + K −, Phys. Rev. D 78 (2008) 034023 [arXiv:0804.2089] [INSPIRE]. FOCUS collaboration, Dalitz plot analysis of the D + → K − π + π + decay in the FOCUS experiment, Phys. Lett. B 653 (2007) 1 [arXiv:0705.2248] [INSPIRE]. LHCb collaboration, Studies of the resonance structure in D 0 → K ∓ π ± π ± π ∓ decays, Eur. Phys. J. C 78 (2018) 443 [arXiv:1712.08609] [INSPIRE]. LHCb collaboration, Studies of the resonance structure in D 0 → K S0 K ± π ∓ decays, Phys. Rev. D 93 (2016) 052018 [arXiv:1509.06628] [INSPIRE]. BaBar collaboration, Dalitz plot analyses of J/ψ → π + π − π 0 , J/ψ → K + K − π 0 and J/ψ → K S0 K ± π ∓ produced via e + e − annihilation with initial-state radiation, Phys. Rev. D 95 (2017) 072007 [arXiv:1702.01551] [INSPIRE].